Common in English folklore are so-called black dogs, regarded as demonic entities by some and benign beings by others. 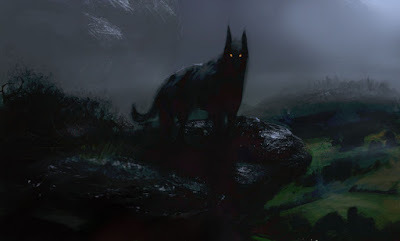 One of the more well-known of the black dogs is Black Shuck, which roams the East of England and is said to have inspired the Sherlock Holmes story ‘The Hound of the Baskervilles’. Shuck, as he is sometimes known, is said to protect souls as much as he causes them harm. Needless to say, Gwentshire was going to have its own black dog in the form of Ald Jack. When I originally pitched the setting idea, he was going to be called ‘Grim Jack’. But the Old English word for ‘old’ seems a better fit and helps define Gwentshire’s relationship with the hound. Jack is agnostic, a little like the legendary Black Shuck, in that he’s just as likely to be a foe for the characters as he is an ally. He’s also just as likely to ignore the characters and purpose his own agenda. Just like the Mist-Bound, the origins of Ald Jack are uncertain. It is believed that he has been around since Pre-Roman times, archaeological evidence found throughout Gwentshire would seem to support this. Surviving historical texts held in the archives of the Gwentford Shire Hall include a number of references to Ald Jack over the centuries and at least one brewery has used his name for a beverage. To use Ald Jack, use the stats for a Hellhound from the Horror Companion. Add the Champion Edge and Tracking d6.